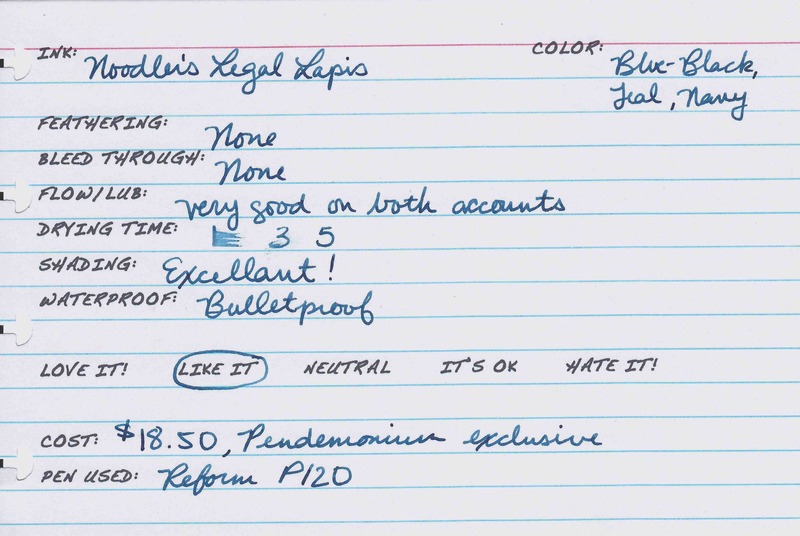 It’s Noodler’s week here at The Dizzy Pen, so here is Noodler’s review 2 of 3: Noodler’s Legal Lapis. For months and months I’ve seen folks on FPN raving about this ink. I’ve seen it described as the best Noodler’s ink on the market and the best bulletproof ink available second only to Noodler’s Black. I’ve seen the color described as a blue-black and a teal ink. On both accounts I’m largely undecided. I like this ink, but I don’t love it. It’s very good and well-behaved to be sure, but it’s not in a color range that I prefer. It’s definitely a blue-black of one sort or another, but there is a green or teal undertone to it. It doesn’t seem very pronounced, but it is there. No feathering or bleed through. The flow and lubrication is very good on both accounts. This is definitely a smooth writing ink. It dries pretty quickly at about 5 seconds. The shading is PHENOMENAL especially if you are a printer. This ink is bulletproof. It stands up very well to water. This ink is a Noodler’s exclusive made for Pendemonium. It’s a little more pricey than other Noodler’s inks at $18.50 for 3 oz. You can find more info about this ink including water tests if you click here. Doesn’t the color of this ink also depend upon the pen and paper being used? That’s what I heard. So far it’s been about the same no matter the pen. It’s always a blue-black with varying degrees of green or teal. I like the color. Too bad I can’t find it online anymore. I hope they haven’t stopped producing it.